Please see attached 2 photos, that show your product performing fantastically in -5 degC. 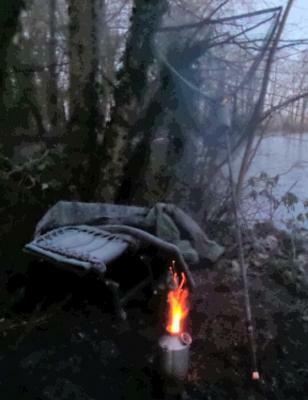 The fuel I used was recovered from the woods around the frozen lake; A bit of crunched up news paper, some leaves and plenty of recovered twigs and small branches. Ironically the gas and meths stoves that I carry in my car as back ups would not ignite. The water still boiled inside five minutes. Your Kelly kettle is without doubt one of the most efficient and practical stoves I have owned in over 30 years of outdoor living, thank you. Traveling the Globe with the XSTREAM straw filter. A brilliant little piece of kit.